Some 3.6 million people in the United States rely on epinephrine auto-injectors to save their lives in the event of a severe allergic reaction. But since 2009, out-of-pocket costs for the auto-injector devices have skyrocketed from $100 for two doses to $600, which is problematic because users typically need multiple devices stored at various locations and the shelf life is approximately 18 months. This year, critical shortages drove the FDA to stretch the product’s expiration date by four months. The situation led Drake Assistant Professor of Pharmacy Practice Lynn Kassel to question where the threshold of safety actually lies for the lifesaving device. 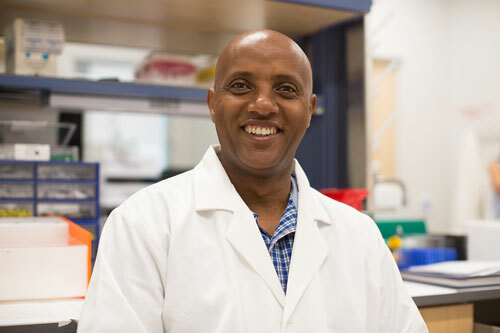 Kassel, an EpiPen user, connected with Associate Professor of Pharmaceutics Abebe Mengesha to find out. They hired P1 pharmacy student Caroline Jones, then a sophomore pre-pharmacy student, to research answers in the lab. Jones has a passion for the project that hits close to home. She, too, has a food allergy that requires an EpiPen. 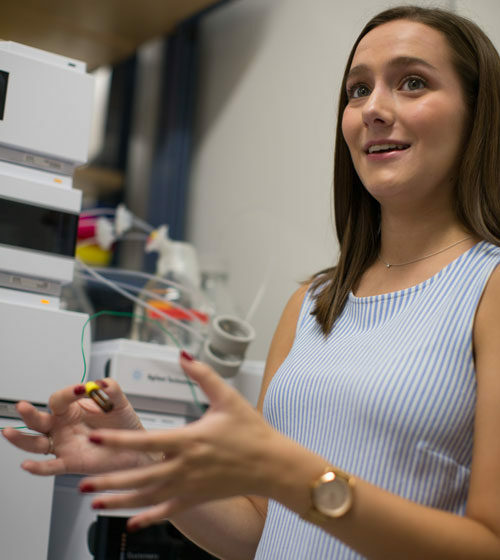 Jones responded to one of the College of Pharmacy and Health Science’s regular calls for student researchers due to her desire to be involved with research early in her academic career and her personal connection to the study. What’s next? The project doesn’t stop there, says Jones. The research answered some questions, but raised even more interesting ones. And she, Mengesha, and Kassel plan to keep searching for answers. Jones’ time in the lab with Mengesha and Kassel also grew collaborative relationships that brought her future into clearer focus. The goal of the project was to figure out why EpiPens expire so quickly by forcing the degradation of epinephrine in a lab and measuring it. The work also led Jones to earn a Drake Undergraduate Science Collaborative Institute (DUSCI) research fellowship and a NASA merit scholarship, as well as an opportunity to present findings with Kassel at a national conference.